Los Angeles celebrates Martin Luther King, Jr. Day with a variety events from parades to museum events, the most prominent of which is the MLK Kingdom Day Parade in South Los Angeles. The Kingdom Day Parade in Los Angeles happens each January, on the federally recognized Martin Luther King Day holiday Monday. In 2017, the parade will be held on Monday, January 16. It begins at 11 am at Martin Luther King Blvd and Western Ave, traveling west on Martin Luther King Jr. Blvd to Crenshaw Blvd, south on Crenshaw Blvd to Vernon Ave with a festival along Crenshaw at Leimert Park. The City of Long Beach will hold their Martin Luther King, Jr. Peace & Unity Parade Celebration on Saturday, January 14, 2017, beginning at 10:30 am along Martin Luther King Jr. Ave from 7th Street north to King Park, where a festival will be held from 12:30 to 6 pm. Kidspace Celebrates MLK and Cultural Diversity Days: Kidspace children's museum in Pasadena will honor Dr. King's mission of breaking down cultural walls by presenting a multicultural program of entertainment and activities including building new worlds in the Imagination Workshop, adding handprints to a giant peace mural and sharing hopes for the world on a Dream Board. Saturday to Monday, January 14-16, 2017, Saturday and Sunday 10 am to 5 pm, Monday 9:30 am to 5 pm. 480 North Arroyo Blvd, (626) 449-9144. Click through for photos of a previous Kingdom Day Parade with Stevie wonder as the Grand Marshal. 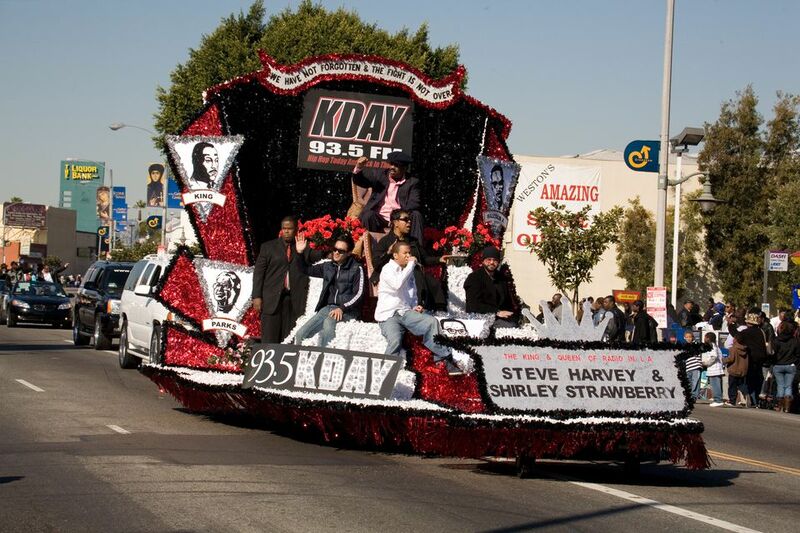 Stevie Wonder was Grand Marshall of the Kingdom Day Parade in Los Angeles in 2007. The Kingdom Day Parade in South Los Angeles always draws a crowd. High School JROTC students marching in the Kingdom Day Parade in Los Angeles. A young spectator at the annual Kingdom Day Parade in South Los Angeles. Happy spectators at the annual Kingdom Day Parade in Los Angeles on Martin Luther King, Jr. Day in January. A spontaneous group of drummers gathers at Leimert Park during the Kingdom Day Festival after the Kingdom Day Parade in South Los Angeles. The businesses on Degnan Blvd in Leimert Park Village participate in the Kingdom Day Celebration in Los Angeles.